Johnson Lee, Tommy Tam (Ti Lung) and Chin Siu Ho yesterday promoted their new film STAYCATION (YUT GA DAI SAI). Johnson said that the film yesterday officially opened and the admission rate was decent. He looked forward to good word of mouth and later will promote in Malaysia as well. Johnson mentioned that he made a high price offer to Ti Lung. He said that each actor has his worth. He disliked calling in favors or haggling and would pay whatever the actor was worth. Brother Lung said that he was very pleased with the salary and very happy to work with Johnson. 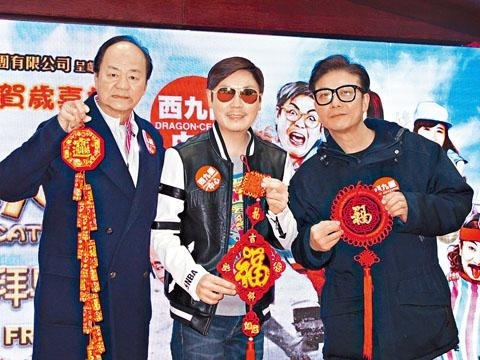 Brother Lung has been promoting frequently and admitted that he was very concerned about Hong Kong film's direction. He said that the Korean film industry learned to absorb other people's advantages and kept improving. He urged the Hong Kong and Mainland film industry to know others as well as themselves and focused on making good movies. Speaking of the Lunar New Year, Brother Lung and Chin Siu Ho both would stay in Hong Kong as they joked that they did not want to travel and cram with others. Johnson would perform in Toronto.